Download All Of Our Apps! Click Here to learn about and contact your favorite Anchors, Reporters and Meteorologists! We have been informed by Comcast that they have discontinued carriage of WDVM-TV on its system in Franklin County, Pennsylvania. Please be assured that Comcast is not removing WDVM-TV from its Franklin County system because of any dispute between Comcast and Nexstar regarding Comcast’s carriage of WDVM-TV. Rather, Franklin County is outside of WDVM-TV’s home market of Washington, DC and Comcast has informed us that effective in March it will no longer carry WDVM-TV out of market. If you disagree with Comcast’s decision, we urge you to contact them directly at 717-516-0682. 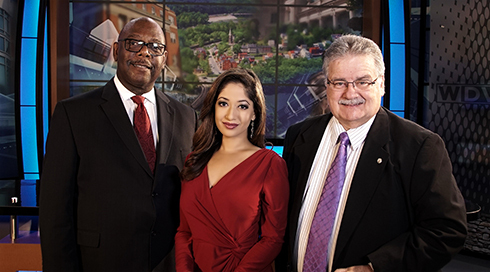 WDVM-TV intends to continue to serve our local viewers and communities, including Franklin County. For our viewers in Franklin County, WDVM-TV’s over-the-air signal is available for viewing with a digital antenna. In addition, we will continue to share news reports and other information here on www.localdvm.com on the localDVM mobile app and you can follow us on Facebook. We look forward to continuing to serve you. The nation's first over-the-air broadcast television network for women. This fully programed network targets women with a mix of theatrical motion pictures and off net series, 24 hours per day 7 days per week. ESCAPE'S movie lineup includes titles such as Body Heat, Presumed Innocent, Fatal Attraction and Misery and Malice, among others. ESCAPE also features some of the greatest true crime series in television history including Snapped, Unsolved Mysteries, Forensic Files and more. Viewers may visit www.escapetv.com for the full programming schedule. The nation's first over-the-air broadcast network dedicated to bold, brave and legendary action heroes. This fully programed network targets men with a focus on western, war and action theatrical motion pictures, 24 hours per day and 7 days per week. GRIT's movie line-up includes The Rookie, I-Spy, Any Which Way You Can and Firefox, among others. GRIT also features some of the greatest classic and western series in television history including Walker Texas Ranger, Laramie, Sergeant Preston of the Yukon, Lassie, Zane Grey Theatre and more. Viewers may visit www.grittv.com for the full programming schedule. LAFF is the country’s first over-the-air broadcast network devoted to comedy. The fully programmed network features some of the most popular sitcoms in contemporary history, 24 hours per day, 7 days per week. LAFF features programs such as, The Drew Carey Show, Night Court, Empty Nest, Grace under Fire and Ellen DeGeneres’ first sitcom, Ellen. LAFF will also showcase great theatrical motion pictures such as Jerry Maguire, Sleepless in Seattle, The Story, The Distinguished Gentleman and more. Viewers may visit www.laff.com for the full programming schedule. Do you have DirectTV? You can still receive WDVM-HD by purchasing a small digital antenna from a local retailer. To learn more about our agreement with DirecTV click here.